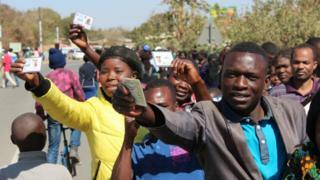 Zambia's main opposition party has alleged fraud in Thursday's presidential vote and called for a recount of votes in the capital Lusaka. The UPND party, led by Hakainde Hichilema, has withdrawn from the ballot verification process. President Edgar Lungu, of the governing PF party, holds a slim lead over his rival Mr Hichilema, with votes counted in more than 80% of constituencies. The Patriotic Front party has rejected the allegations. Mr Lungu has called for calm and for the will of the people to be respected. For the first time, a presidential candidate must win more than 50% of the vote to avoid a run-off. Mr Lungu won the last election by less than 28,000 votes. The UPND accused the Electoral Commission of Zambia (ECZ) of bias in favour of the PF. Election officials denied this, saying the slow publication of the results was because there were five different votes on Thursday - for president, parliament, mayors, local councillors and an amendment to the constitution on changes to the bill of rights. With votes counted in 132 out of 156 constituencies, Mr Lungu has 50.1% of the vote against 47.7% for Mr Hichilema, according to the ECZ.